Most people think that the name MASH is a throwback to the old 70s TV series about an army hospital. It’s not, instead it is an abbreviation of Modern American Steak House. And that is exactly what MASH is. A group of highly acclaimed Danish restaurateurs has gotten together and created the definitive interpretation of a steak house in Copenhagen. There is no doubt that this is the place to go for steak! The décor is red and velvety, the staff professional and courteous and the meat is outstanding. 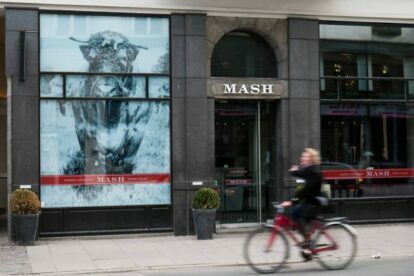 MASH have chosen to carry both American hormone-free beef from Nebraska and Danish beef dry aged for 90 days. Both are excellent although surprisingly different. Actually, the only regret I have about MASH is that you can’t mix and match the different types. I would love to get a serving with similar cuts from different live stock and taste the difference. To top that off, MASH serves a selection of starters (Lobster, Foie Gras terrine, Cesar Salad etc) and a great choice of classic American side dishes (e.g. Macaroni & Cheese, Mashed potatoes, Green Beans). Of course MASH has a great wine list, but not to be neglected is the great bar by the entrance. It serves fab cocktails and a house brand beer. The signature Margarita is one of my favorites. MASH can also be found at Skovriddergaarden north of Copenhagen, at Copenhagen Airport, in Aarhus and in London.